Indonesia’s tsunami-warning system has been out of commission for six years, officials revealed in the wake of the series of giant waves that just killed at least 373 there — and as the country’s president ordered its disaster agency to finally purchase a new early system Monday. Victims on Indonesia’s islands of Java and Sumatra were taken totally by surprise when the Anak Krakatau volcano eruptions caused an underwater landslide that sent the tsunami crashing into their coasts Saturday. The nation of islands has a network of tsunami-detecting buoys — devices floating off the country’s coasts designed to submit warnings about big waves to its national disaster agency — but they have been broken since 2012, an agency spokesman said. “Vandalism, lack of funds, technical faults have caused the current absence of the tsunami buoy system,” said Sutopo Purwo Nugroho in a series of tweets, according to Channel NewsAsia. But experts say that even if the buoy system had been working, it probably wouldn’t have offered much warning because the volcano was so close to the islands’ coastline. “Tsunami warning buoys are positioned to warn of tsunamis originated by earthquakes at underwater tectonic plate boundaries,” David Rothery of the UK’s Open University told the Jakarta Post. Indonesian President Joko Widodo on Monday ordered the agency to purchase new early detection and warning systems that will give people enough time to get to safety. 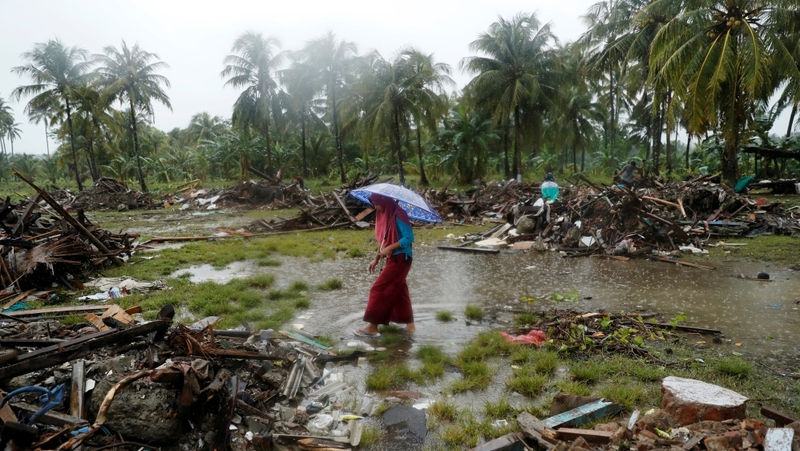 “I have instructed BMKG to purchase equipment for early detection, early warning systems that will be able to provide timely alerts for civilians, so that they can take action quickly,” he said while visiting the affected areas, per Channel NewsAsia. Authorities widen no-go zone around ash-spewing Anak Krakatoa days after it caused powerful tsunami killing hundreds. The move on Thursday by Indonesia's air-traffic control agency AirNav came as the volcanic island located in the Sunda Strait between the islands of Java and Sumatra continued spewing columns of ash into the air. "All flights are rerouted due to Krakatoa volcano ash on red alert," AirNav said in a statement. Authorities also raised the volcano's alert level to the second-highest - 'stand-by" - and widened an exclusion zone around it to 5km. 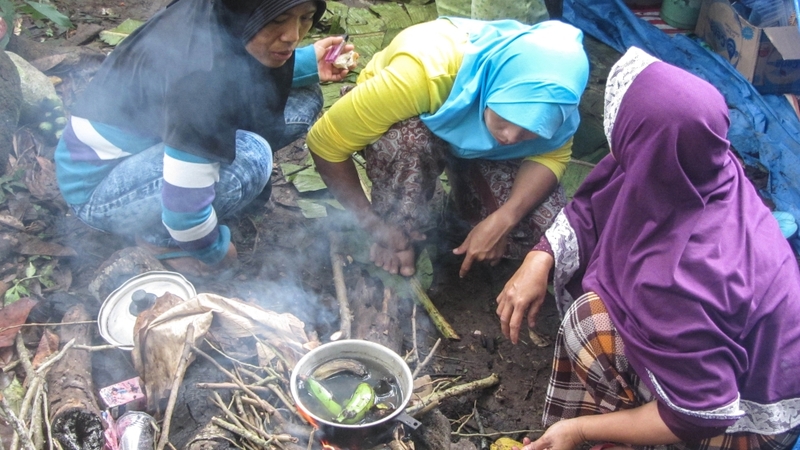 "The lightning around the volcano is getting worse," said Maskah, a 39-year-old woman who has found shelter along with other residents of Sukaraja village in a makeshift camp in Kebun Damos, a partial clearing on Sumatra's Rajabasa Mountain. "It's cold and windy here in the jungle, but we don't want to go home," she told Al Jazeera on Wednesday. "We're scared of the sea." Indonesia's Meteorology, Geophysics and Climatology Agency has asked people to avoid coastal areas as stormy weather and high surf continue to plague the area. "All these conditions could potentially cause landslides at the cliffs of the crater into the sea, and we fear that that could trigger a tsunami," Dwikorita Karnawati, the agency's head, said late on Tuesday. Saturday's tsunami was Indonesia's third major natural disaster in just a few months. In July and August, major earthquakes on Lombok island killed hundreds of people, while in September a devastating earthquake-tsunami claimed more than 2,000 lives in Palu on Sulawesi island. It’s been quite a year for Steamboat Geyser at Yellowstone National Park. Its eruption on Saturday at 1:07 a.m. was its 30th for 2018, breaking the previous record of 29 major eruptions in one calendar year, set in 1964. The erratic geyser, which is tucked away in Yellowstone’s Norris Geyser Basin, was dormant from 1911 until 1961 when it sprang back to life. Then it had three very active years from 1963 to 1965 with the previous record set in 1964. It was dormant again until 1982 and 1983, erupting since then from six months to eight years. Steamboat Geyser is the world’s tallest active geyser — its major eruptions shoot water more than 300 feet , according to the National Park Service (NPS). In a May 2018 update, the U.S. Geological Survey (USGS) noted that Steamboat Geyser appeared to have entered a phase of more frequent water eruptions, much like it did in the 1960s and early 1980s. “Although these eruptions do not have any implications for future volcanic activity at Yellowstone, they are nonetheless spectacular, and many more people had a chance to see Steamboat in eruption during the summer of 2018,” the USGS said. In September, Yellowstone posted a video (see below) of its 19th eruption of the year. The water phase of a major eruption by Steamboat Geyser lasts 3 to more than 40 minutes. Once the water supply is exhausted, the geyser continues with a powerful steam phase lasting several hours to several days, according to the NPS. Its roar is so great that conversation near the geyser is difficult, and visitors in the Norris Campground, a mile to the north, have been awakened by the noise.